Equine Joint Health: Next Level, Nimble Supreme, MSM Powder, HylaRx, HylaLUBE, Flex+ Max, AspirEze Plus, Corta-Flx! 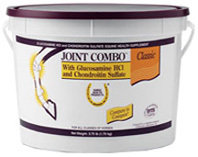 Joint Combo Classic: Joint Combo contains glucosamine HCI and chondroitin sulfate, along with the cofactors manganese and ascorbic acid, in a palatable, cinnamon apple-flavored pellet. Glucosamine and chondroitin are found naturally in the bodies of animals and are necessary for normal joint function. Glucosamine is a natural precursor of glycosaminoglycans (GAGs) and hyaluronic acid. Chondroitin is the primary GAG found in cartilage. Manganese is an important cofactor for the formation of GAGs, and ascorbic acid is required for collagen formation. Together, they act synergistically to support healthy joint function. Palatable cinnamon apple-flavored pellet formula. • Joint Combo Classic: 3.75 lbs. ORDER TODAY! • Joint Combo Classic: 8 lbs. ORDER TODAY! ACTIVE INGREDIENTS (per oz. ): Glucosamine HCl (shellfish) 1800mg, Chondroitin Sulfate (shark) 600mg, Ascorbic Acid 104mg, Manganese (manganese/methionine complex) 16mg. INACTIVE INGREDIENTS: Alfalfa Meal, Dehydrated; Artificial Flavor, Bentonite, Bht and Bha (Preservatives), Cane Molasses, Propionic Acid (Preservative), Wheat Middlings. 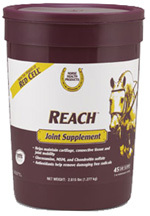 • REACH Joint Supplement: REACH Joint Supplement: Helps maintain cartilage, connective tissue and joint mobility. Contains 5000 mg of Glucosamine along with MSM and Chondroitin. Vitamin C, an antioxidant, helps remove damaging free radicals.Palatable alfalfa-flavored pellets. 2.8 lbs. (45 day supply/1 oz. maintenance serving). ORDER TODAY! ACTIVE INGREDIENTS (per oz. ): Glucosaine Sulfate (shellfish) 5000mg, Methylsulfonylmethane (MSM) 1750mg, Ascorbic Acid (Ester-C) 1000mg, Bromelain 37mg, Chondroitin Sulfate (shark cartilage) 14.5mg, Perna Mussel 3.5mg. INACTIVE INGREDIENTS: Alfalfa Meal Dehydrated, Artificial Flavor, Calcium Stearate, Corn Oil, Lignosulfonate, Propionic Acid, Wheat Middlings. SUPPLEMENTS/JOINT HEALTH: Joint Combo Classic 3.75 lbs. SUPPLEMENTS/JOINT HEALTH: Joint Combo Classic 8 lbs. SUPPLEMENTS/JOINT HEALTH: REACH Joint Supplement, 2.8 lb. • Next Level Equine Joint Pellets: Powerful flex combination helps keep joints lubricated. Preferred alfalfa-flavored pellet formula means less waste, less mess, won’t freeze. Each oz contains 5,000 mg glucosamine sulfate, 1,750 mg MSM, 1,000 mg Ester C, 3.5 mg perna mussel, 14.5 mg shark cartilage and 37 mg bromelain. 1.875 lbs. bucket, 30 day supply. ORDER TODAY! ACTIVE INGREDIENTS per oz. : Glucosamine Sulfate (shellfish) 5000mg, Methylsulfonylmethane (MSM) 1750mg, Ascorbic Acid (Ester-C) 1000mg, Bromelain 37mg, Chondroitin Sulfate (poultry source) 14.5mg, Perna Mussel (natural Hyaluronic Fluid) 3.5mg. INACTIVE INGREDIENTS: Alfalfa Meal, Dehydrated; Artificial Flavor, Calcium Stearate, Corn Oil, Lignosufonate, Propionic Acid (Preservative), and Wheat Middlings. Next Level Equine Joint Fluid: Exclusive fluid supplement helps the body maintain healthy joints. Powerful flex combination of every source of GAGs available. Contains glucosamine, shark cartilage, perna mussel, Ester C® and MSM. Special bromelain enzyme solution absorbs quickly and digests easily. • Next Level Equine Joint Fluid: 16 oz. ORDER TODAY! • Next Level Equine Joint Fluid: 32 oz. ORDER TODAY! ACTIVE INGREDIENTS per fl. oz: Glucosamine Sulfate (shellfish) 5000mg, Methylsulfonylmethane (MSM) 1650mg, Bromelain 37mg, Ascorbic Acid (Ester-C) 30mg, Chondroitin Sulfate (Poultry) 14.5mg, Perna Mussel 3.5mg. Inactive Ingredients: Artificial flavors, Calcium Ascorbate, Caramel Color, Corn Syrup, FD&C Red #40, Glycerin, Potassium Sorbate, Propionic Acid, Water and Xanthan Gum. • Next Level Equine Performance Joint Pellets: Next Level® Performance pellets contain MicroLactin®, a patented dried milk protein concentrate that helps manage inflammation caused by daily exercise and training. Next Level® Performance pellets also contain Glucosamine HCI and Chondroitin Sulfate to support joint health and hip function and maintain cartilage and connective tissue. Veterinarian recommended. Recommended to support healthy joint and hip function. 3.75 lbs. ORDER TODAY! Ingredients: MicroLactin (dried milk protein) 5,000 mg, Glucosamine HCl (marine source) 900 mg, Chondroitin Sulfate (poultry source) 300 mg, Vitamin C (Ascorbic Acid) 50 mg, Zinc 15 mg, Manganese 8 mg.
• FluidFlex Liquid Joint Supplement: The perfect balance of the 3 most preferred active ingredients for healthy joint function. Exclusive formula contains glucosamine HCl, chondroitin sulfate and potent antioxidants. In liquid formula for fast absorption. 32 oz. ORDER TODAY! ACTIVE INGREDIENTS per oz. : Glucosamine HCl (shellfish) 5000mg, Yucca Schidigera 250mg, Chondroitin Sulfate (Shark Cartilage) 100mg, Collagen derived Peptides 85mg, Zinc 40mg, Manganese 30mg, Copper 10mg. INACTIVE INGREDIENTS: Artificial Color, Artificial Flavor, Distilled Water, Potassium Sorbate, Propionic Acid, Sorbitol, Sugar, and Xanthan Gum. 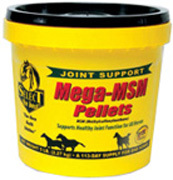 SUPPLEMENTS/JOINT HEALTH: Next Level Equine Joint Pellets, 1.875 lb. SUPPLEMENTS/JOINT HEALTH: Next Level Equine Joint Fluid, 16 oz. 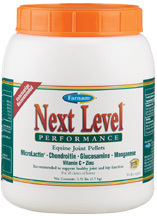 SUPPLEMENTS/JOINT HEALTH: Next Level Equine Joint Fluid, 32 oz. SUPPLEMENTS/JOINT HEALTH: Next Level Equine Performance, 3.75 lbs. SUPPLEMENTS/JOINT HEALTH: FluidFlex Liquid Joint Supplement, 32 oz. • Nimble Mega Nutrient: Nimble Mega balances the ration as well as covering several other supplemental needs. Nimble Mega is an exceptional choice for easy keepers that do not need calories from invigorated grain. Nimble Mega fully strengthens the diet! 2 oz scoop included. 3.75 lbs. buckets (30 day supply @ 2 oz. serving). ORDER TODAY! Active Ingredients per 4 oz. serving: Glucosamine HCI (source Shellsh) 15,000 mg, Calcium (as Calcium Carbonate) 2,800 mg, Salt 2,200 mg, BioCell Collagen (source chicken sternal cartilage) 2,000 mg, Hyrolyzed Collagen Type II 1,200 mg, Chondroitin Sulfate 400 mg, Hyaluronic Acid (HA) 200 mg, Phosphorus (as Dicalcium Phosphate) 1,300 mg, Linolenic Acid (Omega-3) 1,000 mg, Lysine (as l-Lysine) 900 mg, Methionine (as Dl-Methionine) 900 mg, Magnesium (as Magnesium Oxide) 900 mg, Ascorbic Acid (stabilized) 500 mg, Zinc (as Methionine complex) 285 mg, Linoleic Acid (Omega-6) 250 mg, Manganese (as Amino Acid complex) 190 mg, Copper (as Amino Acid complex) 95 mg, Choline (as Choline Chloride) 75 mg, Thiamine (as thiamin mononitrate) 45 mg, Niacin 38 mg, Riboavin 30 mg, Pantothenic Acid (as Calcium Panthothenate) 15 mg, Vitamin B6 (as Pyridoxine HCI) 15 mg, Folic Acid 15 mg, Biotin (as D-Biotin) 7.5 mg, Iron (as Ferrous Sulfate) 3.0 mg, Cobalt (as Cobalt Sulfate) 1.0 mg, Selenium (as Selenium Yeast) 1.0 mg, Iodine (as Ethylenediamine Dihydriodide) 1.0 mg, Vitamin B12 (as Cyancobalamin) 45 mcg., Vitamin A (as Vitamin A Acetate) 20,000 I.U., Vitamin D3 2,000 I.U., Vitamin E (as Dl-Alpha-Tocopheryl Acetate) 1,000 I.U. Inactive Ingredients: Corn Distiller's Dried Grain With Solubles, Dextrose, Mixed Tocopherols, Natural And Artificial Flavors, Propionic Acid, Silicon Dioxide, & Yeast Culture. • Nimble Supreme: Nimble Supreme contains the molecularly enhanced and digestible HA and Chondroitin, Collagen and potent levels of Glucosamine. Nimble Supreme is the ideal choice for performance horses as it nutritionally supports joints and offers support for tendons and ligaments. Minerals and Amino Acids works together to maintain the joints and surrounding tissues also. Feed this product along with a balanced diet. The digestive aid prebiotic base is a plus to any diet as well. 1 oz scoop included. 3.75 lbs. (60 day supply at 1 oz. serving). ORDER TODAY! ACTIVE INGREDIENTS PER 2 oz. : Glucosamine HCI (source Shellfish) 15,000 mg, BioCell Collagen (source chicken sternal cartilage) 2000 mg, Hydrolyzed Collagen Type II 1200 mg, Chondroitin Sulfate 400 mg, Hyaluronic Acid (HA) 200 mg, Ascorbic Acid (stabilized) 500 mg, Linolenic Acid (Omega-3) 500 mg, Methionine (as Dl-Methionine) 330 mg, Lysine (as L-Lysine) 220 mg, (source poultry) 200 mg, Linoleic Acid (Omega-6) 125 mg, Zinc (as Methionine Complex) 100 mg, Manganese (as Amino Acid Complex) 80 mg, Copper (as Amino Acid Complex) 30 mg. INACTIVE INGREDIENTS: Corn Distiller's Dried Grain With Solubles, Dextrose, Mixed Tocopherols, Natural And Artificial Flavors, Propionic Acid, Silicon Dioxide, Stabilized Flax Meal, and Yeast Culture. • Nimble Ultra: Nimble Ultra is an exclusive product for joint support as it contains Glucosamine and Cetyl Myristoleate or CM. The potent levels of Glucosamine offer joint specific nutrients, CM is a natural occurring fatty acid that is a natural anti-inflammatory nutrient. Nimble Ultra is ideal for nutritionally supporting joints in horses in work, and an particularly good choice for older horses due to the CM component. Nimble Ultra is made with Omega-3 Fatty Acids, Vitamin C and organic minerals. The prebiotic base is great for digestive health as well. 3.75 lbs. (granular) (60 day supply at 1 oz. serving). ORDER TODAY! Active Ingredients per 2 oz. : Glucosamine HCI (source shellfish)15,000 mg, Ascorbic Acid (stabilized) 500 mg, Linolenic Acid (Omega-3) 500 mg, Methionine (as Dl-Methionine) 320 mg, Lysine (as L-Lysine) 180 mg, Linoleic Acid (Omega-6) 125 mg, Zinc (as methionine complex) 100 mg, Cetyl Myristoleate complex 100 mg; Manganese (as Amino Acid Complex) 80 mg, Copper (as Amino Acid Complex) 30 mg. Inactive Ingredients: Corn distiller’s dried grain with solubles, Dextrose, Mixed Tocopherols, Natural and Artificial Flavors, Propionic Acid, Silicon Dioxide, Stabilized Flax Meal, and Yeast Culture. SUPPLEMENTS/JOINT HEALTH: Nimble Mega-Nutrient, 3.75 lbs. SUPPLEMENTS/JOINT HEALTH: Nimble Supreme, 3.75 lbs. SUPPLEMENTS/JOINT HEALTH: Nimble Ultra, 3.75 lbs. • MSM Powder: Methylsulfonylmethane, commonly known as MSM (99%), is a metabolite of DMSO (Dimethyl Sulfoxide). Found in nature, MSM has been used as a carrier for various compounds. MSM is an odorless, virtually tasteless, white crystalline substance often used for joint support and improved blood circulation. Fast Assimilation. • MSM Powder: 1 lb. 46-day supply for one horse. ORDER TODAY! • MSM Powder: 2 lbs. 92-day supply for one horse. ORDER TODAY! • MSM Powder: 4 lbs. 184-day supply for one horse. ORDER TODAY! • Mega MSM Pellets: A pelleted form of MSM blended with stabilize Rice Bran which is easier to administer, has better taste acceptance and is the most socially responsible form. Each administration of Mega MSM yields 10,000 mg of MSM. Mega MSM is more palatable than straight MSM. 5 lbs. ORDER TODAY! Ingredients: Methysulfonylmethane, Artificial and Natural Flavoring, Lignosulfonate Condensed, Stabilized Rice Bran. 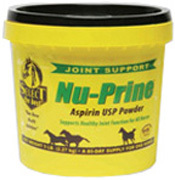 • Nu-Prine Aspirin USP Powder: Nu-Prine supports comfort and joint health with Aspirin (Acetylsalicylic Acid) formulated with molasses and Apple Flavor for better palatability. Over 14,000 mg of buffered Aspirin per application. It's easier to administer, as well as a healthy option when compared to other alternatives. Great Value! 5 lbs. ORDER TODAY! Ingredients: Vegetable Oil, Acetylsalicylic Acid (Aspirin), Sodium Silico Aluminate, Maltodextrin, Artificial Flavor, Polysorbate 80, Potassium Sorbate. SUPPLEMENTS/JOINT HEALTH: MSM Powder, 1 lb. SUPPLEMENTS/JOINT HEALTH: MSM Powder, 2 lbs. SUPPLEMENTS/JOINT HEALTH: MSM Powder, 4 lbs. SUPPLEMENTS/JOINT HEALTH: Mega MSM Pellets, 5 lbs. SUPPLEMENTS/JOINT HEALTH: Nu-Prine Aspirin , 5 lbs. • Nu-Flex Maximizer w/HA: Nu-Flex Maximizer™ with HA provides 7,500 mg of Glucosamine HCI per ounce with the added benefit of Hyaluronic Acid (HA). It also contains balanced levels of the antioxidant Vitamins E, C and Beta-Carotene, as well as the natural herb, Yucca. Together, these provide support for sport horses and horses ages five to 15 years. Joint support for younger sport and perfornace horses. • Nu-Flex Maximizer w/HA: 1.9 lbs. ORDER TODAY! • Nu-Flex Maximizer w/HA: 5 lbs. ORDER TODAY! ACTIVE INGREDIENTS Per 1 oz. : Glucosamine (Shellfish) 7,500 mg, Yucca Schidigera (min) 5,250 mg, Calcium Ascorbate as Ester-C (min) 1,050 mg, Vitamin E (min) 112 I.U., Hyaluronic Acid Sodium 24.77 mg, Beta-Carotene (min) 3 mg. INACTIVE INGREDIENTS: Ground extruded Soybeans and Tertiary Butyl Hydroquinone. 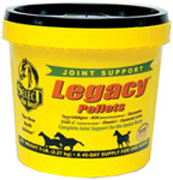 • Legacy Pellets: Formulated specifically for senior horses, Legacy is an unmatched value that supports joint, connective tissue and soft tissue health in horses 15 years or older. Easy-to-administer pellets contain the key ingredients Glucosamine, Chondroitin Sulfate, MSM (Methylsulfonylmethane), Yucca, Ester-C® and Vitamin E. Also contains stabilized rice bran and dry yeast culture for palatability and digestive support. 5 lbs. ORDER TODAY! Ingredients: Rice bran, Yucca Schidigera, Methylsulfonylmethane, Yeast Culture Dehydrated, Glucosamine HCl, Calcium Ascorbate, dl-Alpha-Tocopheryl Acetate, Chondroitin Sulfate, Mixed Tocopherols, Citric Acid, Rosemary Extract, Vitamin C, Lecithin, and Tertiary Butyl Hydroquinone (Preservative). 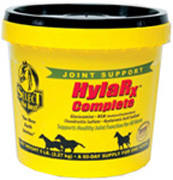 HylaRx Complete: Available in powder form, HylaRx Complete contains the same Hyaluronan (Hyaluronic Acid, or HA) compound as HylaR, but is specially fortified with Glucosamine HCI, MSM (Methylsulfonylmethane) and Chondroitin Sulfate to provide optimal and effective joint support. Now formulated with stabilized rice bran for palatability and easy administration. • HylaRx Complete: 2.5 lbs. ORDER TODAY! • HylaRx Complete: 5 lbs. ORDER TODAY! ACTIVE INGREDIENTS (per 38g): Glucosamine (Shellfish) 7500mg, Methylsulfonylmethane 5000mg, Chondroitin Sulfate (Porcine Trachea) 500mg, Hyaluronic Acid Sodium: 100mg. INACTIVE INGREDIENT: Whey. SUPPLEMENTS/JOINT HEALTH: Nu-Flex Maximizer w/HA, 1.9 lb. SUPPLEMENTS/JOINT HEALTH: Nu-Flex Maximizer w/HA, 5 lbs. SUPPLEMENTS/JOINT HEALTH: Legacy Pellets, 5 lbs. SUPPLEMENTS/JOINT HEALTH: HylaRx Complete, 2.5 lbs. SUPPLEMENTS/JOINT HEALTH: HylaRx Complete, 5 lbs. • HylaRx Liquid Vet Strength: HylaRX Vet Strength is an oral supplement containing Hylaluronan or as it is also known as Hyaluronic Acid (HA) for Joint support. HA has been identified as the main constituency in joint fluid and is key to a healthy joint structure. HylaRX Vet Strength is in liquid form utilizing high Molecular Weight (MW) providing 250 mg per dose! 32 oz. ORDER TODAY! ACTIVE INGREDIENTS Per 2 oz. : Hyaluronic Acid Sodium 250 mg. INACTIVE INGREDIENTS: Water, Hydroxyethylcellulose, Methylparaben, Propylparaben and FD&C Yellow #5. HylaLUBE Apple Flavor: HylaLUBE is an oral supplement containing Hyaluronan or Hyaluronic Acid (HA) for Joint support. HA has been identified as the main reliability in joint fluid and is key to a healthy joint structure. HylaLUBE is in liquid form utilizing high Molecular Weight (MW) and offers a more concentrated dose of 325 mg. per 1 ounce! Also for dogs! Lightly flavored with Apple! • HylaLUBE Apple Flavor: 32 oz. (32 Day Supply For 1 Horse). #908132. ORDER TODAY! • HylaLUBE Apple Flavor: 1 Gallon. (128 Day Supply For 1 Horse). #908128. ORDER TODAY! ACTIVE INGREDIENTS: Hyaluronic Acid Sodium 325mg/1oz. INACTIVE INGREDIENTS: Water, Apple Flavoring, Methylparaben, Propylparaben, and FD&C Yellow #5. • FM Solution: FM Solution is a fast-acting liquid to provide fluid movement, without stiffness. Developed to address the issue of free movement in joints. FM Solution is made with high levels of: 4x Devil’s Claw Extract (Harpagosides), 2x Yucca Schidigera Extract (Saponin), and 100% Pure Methylsulfonylmethane for quick absorption. FM Solution helps support a healthy and natural response to pain and inflammation. 32 oz. #975032. ORDER TODAY! ACTIVE INGREDIENTS Per 1 oz. : Devil's Claw Root 3,300 mg, Yucca Schidigera Extract 2,600 mg, Methylsulfonylmethane (MSM) 2,500 mg. INACTIVE INGREDIENTS: Methlyparaben, Propylparaben, and Water. SUPPLEMENTS/JOINT HEALTH: Hylarx Liquid Vet Strength, 32 oz. SUPPLEMENTS/JOINT HEALTH: HylaLUBE Apple Flavor, 32 oz. SUPPLEMENTS/JOINT HEALTH: FM Solution, 32 oz. Flex+Max Joint Health Supplement Pellets: Flex+ Max offers a new and improved, highly concentrated joint and connective tissue formula with no fillers in both pellet and powder form that is proven to be palatable among horses. Helps support joint and connective tissue and helps maintain strong bones. Guaranteed levels of hyaluronic acid, glucosamine, chondroitin, MSM, boswellia, and flaxseed. Highly palatable fenugreek flavoring. No load-in dosing requirement. Comes with an easy-to-use pre-measured dosage scoop. • Flex+Max Joint Health Supplement Pellets: 5 lbs. Tub/Pellets (30-day supply). ORDER TODAY! • Flex+Max Joint Health Supplement Pellets: 10 lbs. Tub/Pellets (60-day supply). ORDER TODAY! Ingredients: ACTIVE INGREDIENTS per 75g serving: Flaxseed 11g, Rice Bran 5.6g, Glucosamine HCl (Shellfish Source) 10,000 mg, Methylsulfonylmethane (MSM) 5,000 mg, Chondroitin Sulfate (Porcine Source) 1,200 mg, Hyaluronic Acid 150 mg, Boswellia Serrata 130 mg. INACTIVE INGREDIENTS: Alfalfa Meal Dehydrated, Calcium Propionate (preservative), Fenugreek Seed, Yeast Culture. 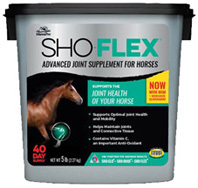 • SHO FLEX Joint Supplement: Sho-Flex is an advanced Joint supplement that helps support the mobility of your horse with 10,000 mg of Glucasamine HCI, MSM and Chondrotin Sulfate. Sho-Flex helps support optimal joint health and maintain joints and connective tissue. Contains Vitamin C, an important Anti-oxidants. scientifically formulated to support your horses’ best health and performance. 5 lbs. Bucket (40 day supply). #1000071. ORDER TODAY! Active Ingredients Per Two Scoops: Glucosamine HCI (Shellfish) 10,000 mg, Methylsulonylmethane (MSM) 5,000 mg, Chondroitin Sulfate (Porcine) 1,200 mg, Ascorbic Acid (Vitamin C) 100 mg. Inactive Ingredients: Anise flavoring, Yeast culture. 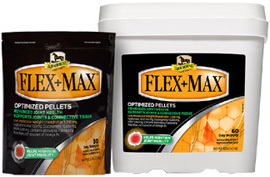 SUPPLEMENTS/JOINT HEALTH: Flex+ Max Pellets, 5 lbs. SUPPLEMENTS/JOINT HEALTH: Flex+ Max Pellets, 10 lbs. SUPPLEMENTS/JOINT HEALTH: SHO FLEX Joint Supplement, 5 lbs. 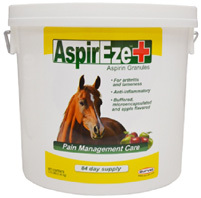 AspirEze Plus: AspirEze + benefits in the temporary relief of pain and inflammation related with arthritis and soft tissue pain in horses. AspirEze + is microencapsulated to improve palatability and for ease of administration by horse owner, buffered for safety. 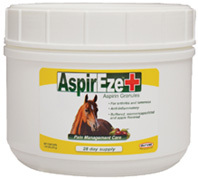 AspirEze + may be used long-term for chronic conditions, such as arthritis and lameness. Tested safe for use in pregnant mares and senior horses. 30% smaller dose means less weight, less shelf space required. No odor or visual evidence of aspirin. Precise, effective dosage established through extensive clinical trials. Apple flavored. • AspirEze Plus: Apple flavored. 1.04 lb. Jar (28 day supply). #001-0548. ORDER TODAY! • AspirEze Plus: Apple flavored. 3.15 lb. Pail (84 day supply). ORDER TODAY! Active Ingredient: Aspirin USP 2500mg per 17 grams. Ingredients: Aspirin, Rice Hulls, Anhydrous Dextrose, Molasses, Calcium Carbonate, Soy Oil, Natural Apple Flavor. 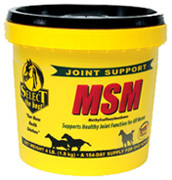 • MSM EQ Joint Support: MSM EQ supports healthy joint function for all horses. 99% Pure. Apple Flavored. 46 day supply. Resealable earth-friendly packaging. Apple flavored. 1 lb. Reclosable bag. #001-0725. ORDER TODAY! ACTIVE INGREDIENT: Methylsulfonylmethane (MSM) 99% 10,000 mgs. INACTIVE INGREDIENT: Apple flavoring. SUPPLEMENTS/JOINT HEALTH: AspirEze Plus, 1 lb. SUPPLEMENTS/JOINT HEALTH: AspirEze Plus, 3.15 lbs. SUPPLEMENTS/JOINT HEALTH: MSM EQ Joint Support, 1 lb. • Corta-Flx HA Solution: Unique liquid formulation for horses suffering from soreness and stiffness resulting from a variety of joint-related problems. Contains a combination of the isolated amino acids (glycine, proline, glutamic acid, glutamine, etc.) that make up both chondroitin and glucosamine, as well as 100 mg/2 oz sodium hyaluronate, 2% crude protein, 0.50% crude fat, 10% crude fiber, vitamins and minerals. Dosage: 2 oz daily for 3 days, thereafter feed Corta-Flx Solution, Powder or Pellets (pg 34) as a daily supplement with the regular feed. Mix with the daily feed or give orally. 1 pt contains 8 servings. 32 oz. ORDER TODAY! Ingredients: Water, Sorbitol, Glycine, L-Proline, Condensed Extracted Glutamic Acid Fermentation Products, Pyridoxine Hydrochloride, Manganese Sulfate, Ascorbic Acid, Copper Sulfate, Sulfur, L-Arginine, L-Threonine, L-Tyrosine, Animal Protein Products, Gelatin, L-Lysine, DL-Methionine, L-Serine, L-Valine, L-Phenylalanine, L-Glutamine, L-Histidine, L-Isoleucine, L-Aspartic Acid, L-Alanine, Xanthan Gum (Homogenizing Agent), Sodium Benzoate (a preservative), Yucca Schidigera Extract (a natural flavoring agent), Natural and artificial flavors. 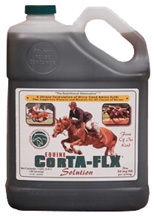 • Corta-Flx Solution: Water soluble formulation of amino acids, vitamins, and minerals for horses suffering from soreness and stiffness resulting from a variety of joint-related problems. Contains a combination of the isolated amino acids (proline, glycine, glutamic acid, glutamine, etc.) that make up both chondroitin and glucosamine plus 40 mg/oz mixed in a very palatable cherry-flavored base. Dosage: 2 oz daily for 5 days, then 1/2 - 1 oz daily for maintenance. Mix with the daily feed or give orally. 1 qt contains 32 maintenance servings. 32 oz. ORDER TODAY! • Corta-Flx Pellets: Alfalfa based pellets sprayed with Corta-Flx Solution to deliver the results of a liquid in an easy-to-feed pellet. 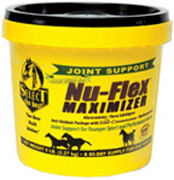 For horses suffering from soreness and stiffness resulting from a variety of joint-related problems. Contains a combination of the isolated amino acids that make up both chondroitin and glucosamine plus 40 mg/oz, 2% crude protein, 0.10% crude fat, 24% crude fiber, vitamins and minerals hyaluronic acid. Dosage: 2 oz daily for 5 days, then 1 oz. daily for maintenance. Mix with the daily feed. 2.5 lbs. ORDER TODAY! Ingredients: Alfalfa Meal dehydrated, Yeast Culture, Glycine, L-Proline, Condensed Extracted Glutamic Acid Fermentation Products, Pyridoxine Hydrochloride, Manganese Sulfate, Ascorbic Acid, Copper Sulfate, Sulfur, L-Arginine, L-Threonine, L-Tyrosine, Animal Protein Products, Gelatin, L-Lysine, DL-Methionine, L-Serine, L-Valine, L-Phenylalanine, L-Glutamine, L-Histidine, L-Isoleucine, Aspartic Acid, L-Alanine, Vegetable Oil, Bentonite, Sodium Benzoate (a preservative), Yucca Schidigera Extract (a natural fl avoring agent), Natural and artificial flavors. SUPPLEMENTS/JOINT HEALTH: Corta-Flx HA Solution, 32 oz. SUPPLEMENTS/JOINT HEALTH: Corta-Flx Solution, 32 oz. SUPPLEMENTS/JOINT HEALTH: Corta-Flx Pellets, 2.5 lbs.